What you don’t know about state leaves could hurt you. From short-term family leave that only Vermont offers (and only for employees who work an average of 30 hours a week and have been with their employer for at least a year) to leave that 25 states offer for victims of crime and violence, the land of unusual leaves is full of potential pitfalls and hazards for HR. You don’t need to be an expert on the varied types of nonstandard leaves in your state, however. Instead, you can take advantage of a cloud-based leave management system from experts whose knowledge, support, and software solutions are aimed solely at helping you better manage leave in your organization. 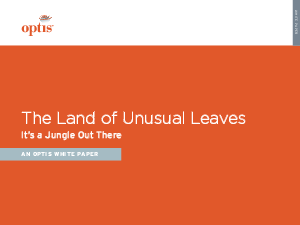 “The Land of Unusual Leaves: It’s a Jungle Out There” from Optis offers examples of the kinds of nonstandard leaves that are out there and solidly explains how a cloud-based leave management system can help HR better navigate the landscape. A cloud-based leave management system, such as LeaveXpert®, is built to apply to organizations of any size. And by providing continuously updated information and correspondence tools for effective leave management, LeaveXpert helps companies mitigate the risk of noncompliance, reduce HR’s time spent managing leave, avoid productivity disruptions, and heighten employee engagement.